BYS: B.A.P announce they "have no plan for a Korean comeback" in recent interview with gokpop! B.A.P announce they "have no plan for a Korean comeback" in recent interview with gokpop! B.A.P recently visited Singapore once again as the first Kpop act to be featured in MTV's s music series MTV Sessions' recording. The group, consisting of Bang Yong Guk, Zelo, Him Chan, Dae Hyun, Young Jae, and Jong Up greeted the press in Singapore via an exclusive interview session with selected media outlets few hours before the recording of B.A.P's MTV Sessions. The boys shared a lot about themselves as well as their music and also their upcoming plans throughout the 45minutes of interview session. Check out the full Q&A session below! 1) You guys are known as Best Absolute Perfect. Can you share with us your not so Best Absolute Perfect moment? Is there any embarrasing moment on stage? Daehyun: We debuted with this strong and powerful image but when we started to do some kind of different stuff like the song “Don’t Do That” and “Crash”, these are kinda melo dance kind of song. So when we did that we feel a little bit embarrassed because it’s different from what we’re from. 2) Where did JongUp get the inspiration to write song? Jong Up: The thing is Yongguk is the one who is actually writing the song apart from me. I am still at the learning stage at the moment so I cannot actually have those kind of inspiration moment for now. It’s more like a learning stage. 3) This is your third time in Singapore in a year. How’s your feeling coming back to Singapore? A: Singapore is the first country we performed (in overseas) after our debut and also the reaction of the fans in Singapore were really great and that made us come back to Singapore. 4) What some of the challenges you faced as a young group? A: In term of the music shows after we debuted, our schedules are really tight. For example we have to do performances over and over again the following days so it was quite hard to for us to adapt to. 5) Recently you have a promotion in Japan. So what’s the different between Korean fans and the Japanese fans? HimChan: When we first performed in Japan, the fans in Japan were different from the fans in Korea because the Korean fans are very passionated and ethusiatic when they see our performances but for the Japanese fans, they are quite moderate and listening to us actually not reacting but nowadays the Japanese fans are becoming more active so we love this kind of changes of the culture. The fans have the Matokki, so everytime we perform, the fans will wave the Matokki, and we like it! 6) You have toured to many countries. Any memorable stage/experience that you guys remember until now? Daehyun: Every single stage that we performed overseas are the most memorable moment especially while we’re doing tour in Europe for time first time this year. We got the chance to be in Europe because of the tour so at this moment, Europe tour is the most memorable experience for us because we experienced something that we never experience before. 7) When will you have a comeback stage in Korea and when will you visit Indonesia? 8) What is your goal for next year since the 2014 is coming to the end? Youngjae: We will be very happy if we’re able to release an album for our fans or perform for our fans. 9) It’s been more than two years since your debut. So what does B.A.P mean to you guys now? Youngjae: After being together for two years now B.A.P is more like a family rather than just members or friends so as time goes by, we’re gonna be stronger and we hope all of us could be a real family. 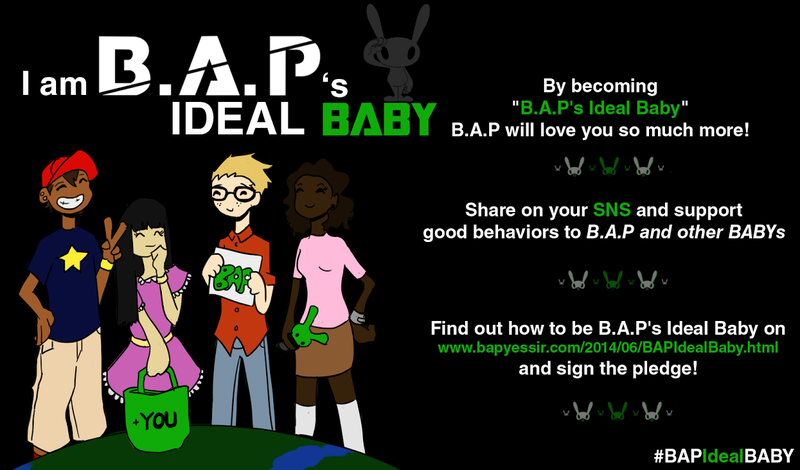 10) Please describe the current status of B.A.P in one word and the reason. JongUp: B.A.P is the best because B.A.P members are always together. 12) Can you share with us what you like and dislike about the members? 13) You guys have been really busy since your debut. Is there anything you miss (about your normal private life)? Daehyun: There are many things that we want to do but we can’t enjoy easily. For example, I cannot go shopping by myself. Like this kind of small minor things in our life, are the things we miss the most . 14) Are there any plan to release the second season of B.A.P attack? Daehyun: We are always ready to film for the season 2 if our company approves it. 15) You guys are staying together in the dorm. Tell us one habit of each other. JongUp: Himchan hyung has a bad habit. We sleep next to each other and when Himchan is sleeping, he moves a lot. Sometimes he will cross the line and sleep on my side. Himchan: JongUp is more or less the same. Whenever we wake up, sometimes we’re at the other side because we move too much while we’re sleeping. 16) Everytime we see you, you have a different hair colour. Is it painful to go through the process? Daehyun: It’s hard to maintain our hairstyle everytime we change it because whenever we go out we have to do something make sure our hair look nice so nowadays we’re trying to cut our hair short so that we can maintain easily. 17) What is the most heartfelt song that Yongguk ever produce? Yongguk: There are many heartfelt songs I produced and I think a little of political theme songs are the most heartfelt songs. 18) Is there any different B.A.P on stage and off stage? HimChan: When we’re off stage, we’re really fun and playful. Once we got on stage, we will show the more cool and profesional side of us. 19) You have tried a lot of different genres before. Is there any genre you guys would like to challenge or try? Daehyun: Yes. We would like to try song like “Excuse Me” , our latest Japanese single, which has a trendy vibe. 20) Among all the Kpop Idols, which group you consider as your rival? Daehyun: We don’t consider any specific Korean group as our rival because we can be combined. We treat them as our role models as well as rivals because we have a lot of things to learn from them and compete against them. 21) What have you learned since your debut? Daehyun: As we’re working in the music industry, we got to meet a lot of people from different industries. So I think we learned a lot of different things to live a more mature life. 22) What inspire Himchan to come out with cute social media name? Himchan: Berry Berry Strawberry? I live with my elder sister when I was young. My sister’s name is YeJi. So I will call her YeJiJi and my name is Himchan so… strong Chanchan. There’s no meaning actually. And it’s very easy to memorize. 23) What’s the best piece of advice you received since debut? 24) Kpop industry recently lost two artists. How does B.A.P feel about this and have your management do anything to tighten the safety when you are travelling? HimChan: It was really heartbreaking and we all pray for them. We hope this kind of incident will not happen again. 25) Which member is the most different off stage and on stage? Daehyun: JongUp because JongUp is really manly on stage but in real life he is just a cute and shy brother. 26) What is the one thing that you wish to be complimented? 27) What do you think about the lip sync ban on music core? Daehyun: Of course there is reason behind it. But as a vocal group, we would like to keep doing it live because that is the most efficient way to express ourselves and that is why we keep doing live instead of lip sync. 28) What’s Yongguk comment about JongUp’s writing skill? It is the responsibility of what you call yourselves and official fansite to accurately translate, report and quote what members say. Errors result in backlash from fans which is a burden to members. You said Yongguk said Jongup's repeating the 8 bars is irritating, which he did not say, Youngjae did. As leader, being misquoted in that way is harmful. Yongguk will never tease his members work. and Youngjae probably just joking and teasing. we know how B.A.P works, they never have hard feeling among themselves, just playful and jokes.